I’d just finished an 8-day trek of the Langtang valley, finishing in Syabrubesi. While enjoying my room in the the BIG city of “Beshi” after 8 days deprivation on the Langtang trek, I got a knock on the door in the morning asking me to check out by 9am. I hung around the dining room, using the slow wifi after 8 days without internet. One MORE hot shower, then I crossed the bridge out of Syabrubesi once again and, once again, started climbing up the Langtang gorge. It was (almost) the same start as Langtang trek 9 days earlier. Once I finally started climbing away from Langtang Khola, it turned out to be an interesting and entertaining (though grueling) ascent. In the forest I ran into a guy hacking away at a live tree. For no reason I could see. Nearby was a stack of human faeces. Perhaps he’s a village idiot. I stopped for lunch at Thulo, a beautiful location. Salty veg, egg, noodle soup. Climbing again after lunch was a challenge. It was tempting to stay for the evening. This is a rich farming valley. At this altitude, harvest was on. Though there are many more Hindus on this trek than on Langtang, it’s still primarily Tibetan Buddhist. Happily, views got even better the higher I climbed. This route is empty compared to Langtang. There is far less litter on the trail. My goal was the lodges at Foprang Danda, reputed to have fantastic views. I was the only guest at both lodges that evening, most everyone else continuing to Sing Gompa, which has no great views. I spent the night chatting with the lodge owner and his wife. And playing with their little dog, Tommy. Their two kids were away at boarding school in Syabrubesi. No solar powered lights in this lodge. Only candles. The owner called his brother, “Bishal Sherpa”, a guide, and arranged for him and I to meet next evening. 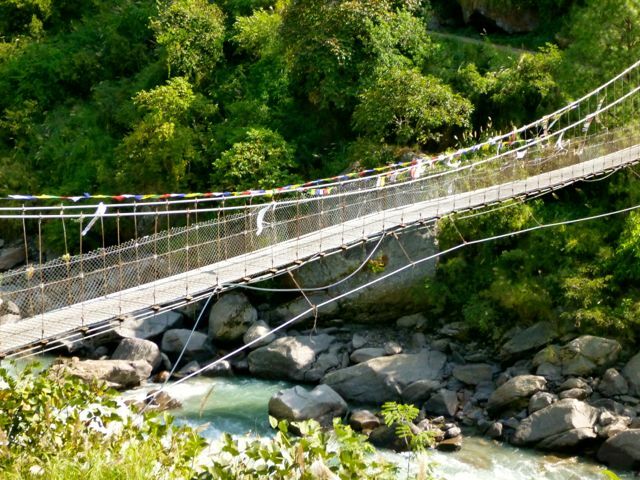 We’d talk about a future possible trek on the Tamang Heritage Trail, a much promoted new route.